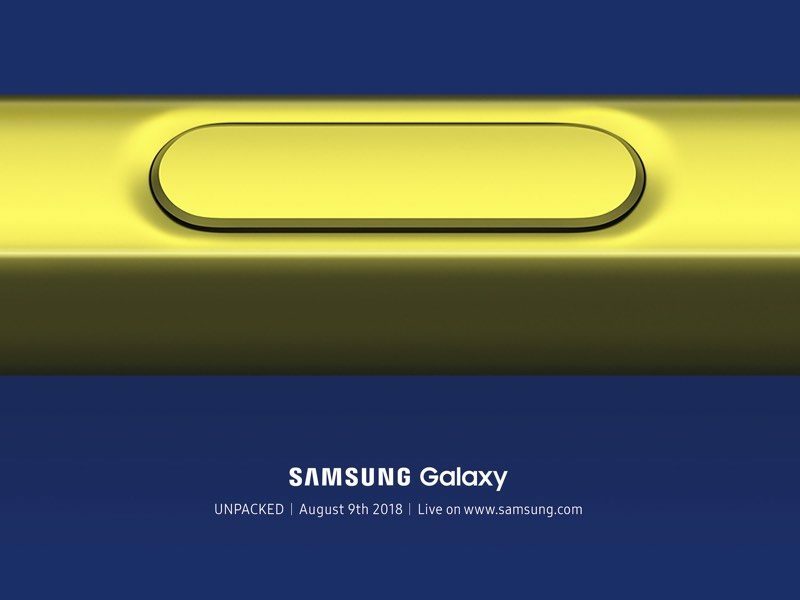 Samsung this morning sent out press invites for an Unpacked event that is set to take place on Thursday, August 9, where it is expected to unveil the next-generation Galaxy Note device, the Galaxy Note 9. The media invitation Samsung sent out, which was shared by Business Insider, appears to feature the button of the S Pen of the Galaxy Note, the accessory that Samsung sells with its Galaxy Note devices. Samsung typically hosts two major smartphone events per year because it launches the Galaxy Note line and the Galaxy S9 line at different times. The Galaxy S9, for example, launched in February, while the Galaxy Note 8, the predecessor to the rumored Note 9, came out last August. Splitting its smartphone launch dates allows Samsung to better compete with Apple by unveiling new technology before and after iPhone launches. The Galaxy Note 9 launch will come just a month ahead of when Apple is expected to unveil its 2018 iPhones, which are rumored to include a second-generation 5.8-inch OLED iPhone, a larger 6.5-inch OLED iPhone that can be thought of as a sort of “iPhone X Plus,” and a 6.1-inch LCD iPhone that will be more affordably priced. Samsung will then follow the 2018 iPhones with new Galaxy S10 devices in February of 2019, if it sticks to its typical smartphone release habits. Like the Galaxy Note 8, the Galaxy Note 9 is likely to continue to offer an edge-to-edge AMOLED display with edge panel and S Pen support, along with dual cameras and a rear fingerprint sensor. Rumors suggest the Galaxy Note 9 will not feature a notch, and that it could have slightly smaller top and bottom bezels than the Note 8, resulting in a 2mm smaller chassis. It is also expected to feature S Pen improvements, and while early rumors pointed towards an in-display fingerprint sensor, it’s not believed Samsung is going to go this route. It was Samsung’s Galaxy Note line that was subject to intense scrutiny after 2016’s Galaxy Note 7 was impacted by faulty batteries that caused fires and injuries to multiple people. Samsung eventually had to recall all Galaxy Note 7 devices, which were also banned by airlines. Samsung decided to continue on with the Note line through 2017’s Galaxy Note 8, which suffered from no major problems.